GitBook’s desktop editor (supporting Mac, Windows and Linux) was a success, loved and cherrished by thousands of authors. However, many authors wanted the simplicity and convenience (no-installation) of a web editor, and as a result of that feedback we went and built an awesome web editor! The web editor fully supports the GitBook format. You can edit the summary using drag and drop, edit your glossary terms, and even create and manage multiple translations from the same workspace. 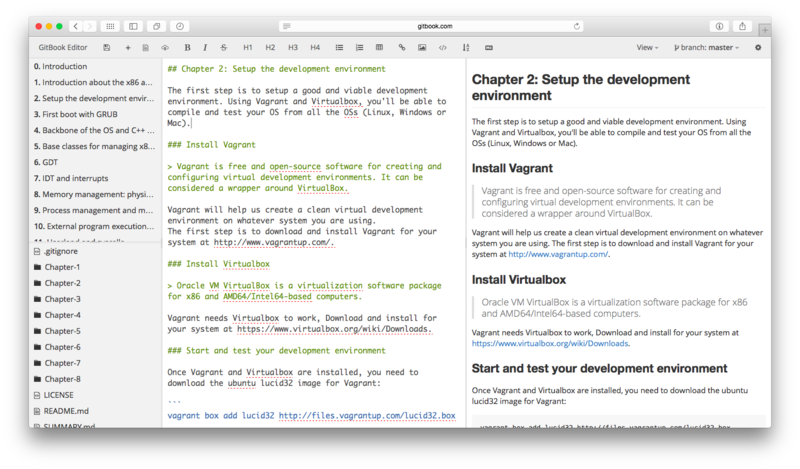 The editor has great GitHub integration (for the technical writers & programmers) and can natively edit books hosted on GitHub. To do so, link your GitHub repository to your book and enable the deployment webhook. This version has been made to simplify and enhance your writing experience. Built in typecheck helps spot spelling mistakes before you save, and the distraction free mode lets you focus on your content. Versioning is a godsend that developers and advanced writers can not live without. We’re bringing that powerful versioning technology (Git) as a first class citizen inside this new editor: you will now be able to create, merge, delete branches ‘till you drop! Versioning will provide you with a complete history/log of all you work, helping you be more organized while also enabling collaboration. What about the desktop editor? The current desktop editor will be replaced in the future by a native “pro” version. In the meantime we won’t be actively updating or supporting it, but you can still download it and check out on GitHub. We encourage you to take the new web editor for a spin. Please send all feedback and bug reports our way so we can make it the awesome editor you deserve! As always, please feel free to reach out to us if you need help, have great feedback to give, awesome product ideas, or you simply want to talk! You can reach us as at support.gitbook.com.